Mesa is a great place to live and offers quality neighborhoods, friendly people and an overall great urban experience. 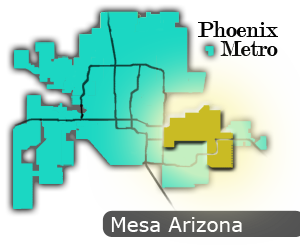 Mesa is one of the highest valued areas in the greater metro area of Phoenix. Homes here exceed the quality of homes almost anywhere else, and the quality of living is also much higher. Mesa is a very affluent Phoenix area to live in. So if you are thinking about real estate in Mesa Arizona, you are making a wise decision.There are 76 schools in Mesa along with several colleges and specialty schools. Apollo College, Arizona State University East and De-Vry University are located in Mesa. These are just of few of Mesa AZ listings, view more of them by using the search on the right. People love living in Mesa because of its beauty, variety of housing choices and a great community atmosphere. And it’s close to Phoenix, where even more opportunities await. Mesa Arizona is a great area for real estate. Home prices have substantially dropped over the past three years, and real estate is quite affordable. Mesa currently has more than 3,500 homes for sale. this includes residential properties, houses and condos. There are also a good number of multi family properties, duplexes, fourplexes and twin homes for sale. To get started viewing Mesa Arizona Real Estate listings, simply click complete the MLS home search form on the right. Mesa is a city found in Maricopa County, it has a population of 437,454 in 2004 the census estimate. It is one of the fastest growing cities in the United States, and is known as the largest suburban city in the nation. Mormon pioneers founded the modern Mesa in 1878.